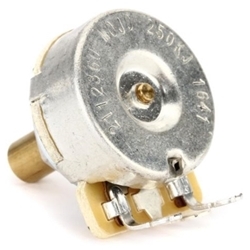 For repair, replacement, or restoration with classic Fender form and function, choose from Fender's wide selection of Pure Vintage electronics â€” like this Pure Vintage 250K solid-shaft potentiometer. From potentiometers to select capacitors to tube sockets and more, these electronics are created to replicate original-era Fender parts and have been used on a number of Fender reissue instruments and amplifiers. They're also versatile enough to fit most newer Fender guitars and tube amplifiers, making it easier than ever to inject that vintage vibe into any setup. Sweetwater Fender players know that for the right look and fit, and for historically reliable performance, genuine Fender parts are the way to go.